The NHL have given Calgary Flames defenseman Dennis Wideman an indefinite suspension after he cross-checked a linesman during his team's 2-1 defeat against Nashville Predators on Wednesday. After being hit into the boards by Nashville's Miikka Salomaki, Wideman skated back to the Flames bench but crashed into Don Henderson from behind, sending him to the ice. Wideman then took his place on the bench looking dazed and confused. After the game, he denied the hit on the official was intentional. "I took a pretty hard hit down in the corner – had pretty good pain in my shoulder and my neck," he said. "I was trying to get off the ice. I kind of keeled over. At the last second I looked up and I saw him. I went over to Donny and apologized on the ice. I didn't know how to get out of the way of him." Henderson made a precautionary visit to hospital after the game, suffering from nausea and neck pain. He was given a concussion protocol. Despite not being penalized during the game, Wideman has now been called to a personal hearing with the NHL on Tuesday. 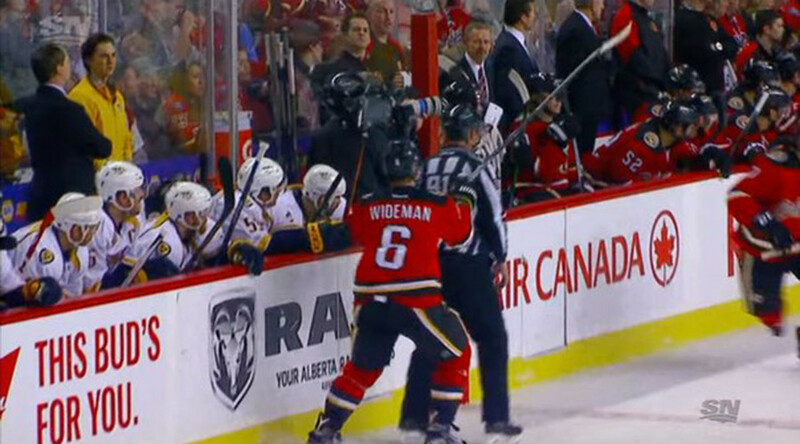 The 32-year-old faces a 10-game ban if found guilty of deliberately attacking the official, although a reduced suspension is possible if the NHL accepts Wideman's version of events. The defenseman was back on the ice just two minutes later and displayed no signs of grogginess, something the NHL may decide to question at Tuesday's hearing. Henderson isn't the only official to have been in the wars during January. On the same night, linesman Jay Sharrers was accidently punched during the Los Angeles Kings and Colorado Avalanche game after an altercation around the net. Kings' forward Milan Lucic was aiming for one of the Avalanche players, but he missed and caught Sharrers instead. He immediately apologized and wasn't penalized. Earlier this month, referee Kelly Sutherland was on the receiving end of a huge hit from Kings' defenseman Jake Muzzin in the first period of their game against Toronto Maple Leafs. He was helped from the ice, but returned in the second to resume his duties.